Dr. Peter Beyersdorf is currently developing techniques in laser interferometry that allow for detection sensitivity beyond the standard quantum limit. This has applications in gravitational wave detection, and will allow detectors such as LIGO, the laser interfereomtric gravitational wave observatory, to probe exotic sources of gravitational radiation such as black-holes, the big bang, and supernova. The focus of the recent research by Professor Carel Boekema and his science and engineering students is the interplay between magnetism and superconductivity in cuprate superconductors. This work has been recognized at international and national conferences and regional meetings. The research highlights the plausibility of magnetism in cuprate vortex states and evidence for d-wave symmetry in cuprates. This group is the first to apply the novel time-series analysis technique Maximum Entropy (ME) to µ SR time histograms. The group also continues with student-co-authored ME- µ SR studies with an emphasis on predicted loop currents in cuprate mME- superconductors. 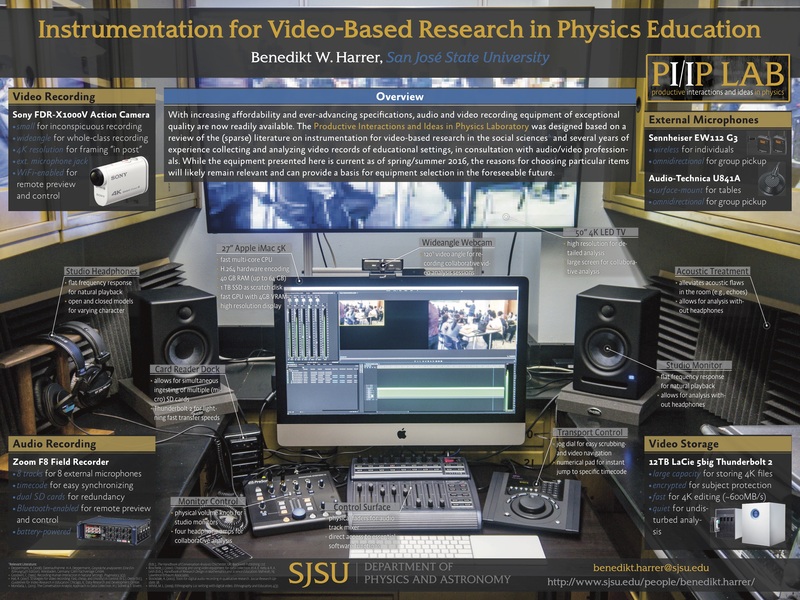 The research is supported by NSF-REU, DOE-LANL and WiSE at SJSU. Professor Garcia's research focuses on the development of Stochastic hybrid models and algorithms for selected multiscale problems arising in fluids. Stochastic methods provide a mechanism to embed the effect of fine-scale processes, such as microscopic fluctuations, into mesoscopic models. In hybrid methods one uses different mathematical models and simulation algorithms at each scale with appropriate linkages to couple the descriptions while maintaining quantifiable fidelity. The systems explored include fluctuating Navier-Stokes equations, where mechanical instabilities can be driven from the microscale and chemically reacting fluids where reaction rates are strongly influenced by microscopic energy. For relevant publications, visit his website. Prof. Garcia is also a physics consultant for film and game studios. Professor Patrick Hamill has been collaborating with scientists at NASA Ames Research Center on two problems. One of these is in atmospheric physics and the other is in astronomy. The atmospheric physics project is a study of the plumes from forest fires which rise high into the atmosphere. These biomass burning plumes are believed to have important effects on the climate of Earth. The other project involves studying the ejecta from the moons of Saturn and Jupiter when these moons are impacted by comets. A symplectic integrator is used to determine the trajectories of the particles and their eventual fate. This project will help us understand the transfer of material from one body in the solar system to another. The goal of Dr. Benedikt Harrer’s research is to reveal mechanisms for how people learn how to “do physics” by interacting with peers and instructors. Dr. Harrer’s Productive Interactions and Ideas in Physics Laboratory (PI/IP Lab) investigates the interactional resources learners and instructors use to develop and express ideas about physical phenomena together. These resources include spoken words and grammatical structure of sentences, but are also multimodal and can include gestures, manipulating materials, gaze, facial expressions, head movements, body postures, and body movements. Using an analytical approach inspired by conversation analysis, Dr. Harrer works to understand how these interactions unfold sequentially, moment-by-moment. Capturing human interaction in enough detail for analysis on this scale requires sophisticated audio and video recording techniques. Developing new systems for recording and analyzing learning interactions in complex environments plays a central role in Dr. Harrer’s research. Dr. Heindl's research involves static and dynamic properties of magnetic thin films, multilayers, and low-dimensional nanostructures (nanowires, nanodots). In particular, he is interested in studying magnetic anisotropy in thin films, exchange-bias, damping, interlayer-exchange-coupling, magnetoimpedance and magnetization reversal process in magnetic nanostructures. His other interest include spintronics, electric transport in nanostructures, and research on emerging materials and devices for future nonvolatile memories. Professor Michael Kaufman studies the interaction between newly formed stars and their natal clouds. Using computer models, he simulates the dynamics, radiation transfer, chemistry and thermal structure of molecular cloud surfaces, and makes predictions for the associated infrared emission from atoms and molecules in the clouds. These predictions, in turn, are used by the international astronomy community to interpret observations from space-based infrared and submillimeter telescopes. He particularly focuses on the important role that common oxygen- and carbon-bearing species, such as water and carbon monoxide, play in the cloud structure and evolution. The models have been applied to observations of the Milky Way, nearby spiral and irregular star-forming galaxies, and to giant elliptical galaxies in the early universe. He has observed with the Caltech Submilliimeter Observatory, the James Clerk Maxwell Telescope, the United Kingdom Infrared Telescope, Hubble Space Telescope, Infrared Space Observatory, the Submillimeter Wave Astronomy Satellite, and the Spitzer Space Telescope; he is also a member of the WISH and HOP Key Project teams, among the first who will use the Herschel Space Observatory after it is launched in Spring 2009. This work is ultimately aimed at understanding the processes that led to the formation of our Sun and solar system, the prevalence of elements important for life to emerge, and the intimate connections between the Universe and humanity. Dr. Khatami studies exotic phases of matter through theoretical modeling and numerical simulation of quantum many-body systems. Pheno mena such as superconductivity, in which the electrical resistance is completely lost upon lowering the temperature, can arise in certain materials due to the strong Coulomb interaction between electrons. Dr. Khatami and his group have been developing and using a diverse set of numerical tools to study such strongly-correlated electronic systems on lattices. Dr. Khatami's numerical findings have recently attracted a lot of attention in the experimental Atomic Molecular and Optics (AMO) community, where researchers are designing “quantum simulators” using atoms on lattices made of lasers (optical lattices) with the aim to discover phases that are inaccessible to numerical methods. The results of his collaborations with groups at Rice University and the MIT-Harvard Center for Ultracold Atoms have been published in Nature and Science. Dr. Kress is a co-investigator with the Virtual Planetary Laboratory, one of the NASA Astrobiology Institute lead teams. Her research with this group focuses on modeling the chemical evolution of protoplanetary disks. This research focuses on how disk chemistry affects the water and organic inventories of habitable planets and how infalling meteoritic debris affects the atmospheric composition and environment of habitable planets. Dr. Kress was a member of the 2003-2004 Antarctic Search for Meteorites. Professor Lui Lam works on Science Matters (SciMat), the new discipline [see the book Science Matters: Humanities as Complex Systems, eds. M. Burguete and L. Lam (World Scientific, Singapore, 2008)] that deals with all human-related matters. In SciMat, humans-the material system of Homo sapiens-are studied scientifically from the perspective of complex systems, with experience gained in statistical physics, neuroscience and other disciplines. In particular, Prof. Lam is interested in the physics of human history (called histophysics), and literature as a science matter-that is, what can the past two thousand and more years of literature tells us about humans when viewed as a complex system? And he is interested in the arts viewed as a science matter. Dr. Quan specializes in Physics Education Research (PER). Her research focuses on the design of sustainable, supportive learning environments and how these environments impact students’ long-term engagement in physics. In particular, she focuses on the relationships and processes which shape students' involvement within undergraduate physics research experiences. Additionally, Dr. Quan studies how STEM departments can develop sustainable change to undergraduate education through facilitated Departmental Action Teams (DATs). Dr. Quan is a co-founder of the Access Network, an NSF funded research-practice community dedicated to fostering community and supporting inclusion efforts in undergraduate physical science programs. Dr. Romanowsky has worked on a variety of astrophysical topics, including dark matter, supermassive black holes, gravitational lensing, the expansion of the universe, modified general relativity, star clusters, planetary nebulae, X-ray emitting hot gas, and galaxy interactions. His research makes use of cutting-edge facilities including the Keck Observatory, the Hubble Space Telescope, and NASA supercomputers. His current emphasis is on the origins of galaxies revealed through their dynamics -- using a combination of observations, theory, and simulations. Coherence, the tendency of wave fronts to positively or destructively interfere with each other, is among the most important phenomena in modern science. The coherent properties of electromagnetism, for example, are directly responsible for the reflectivity of glass, the color of soap bubbles, the clarity of radio amplifiers, and the sensitivity of lidar. More broadly, coherence serves as a fundamental tenet in the theories of acoustics, electromagnetic radiation, superconductivity, and perhaps most universally, quantum mechanics. My research is oriented toward studying the coherent properties of solids using techniques in ultrafast optical spectroscopy. Material systems of interest include atomically thin transition metal dichalcogenides (TMDs), defect centers in diamond and wide-bandgap semiconductors, and excitonic interactions in semiconductor quantum wells. Dr. Switz’s research involves use of optical imaging and spectroscopy to enable measurements in biological systems, particularly for applications in medical diagnostics. Using new technology to enable low-cost extension of medical diagnosis to low-resource areas is a particular interest, and devices he has helped design have been deployed in multiple countries, most recently in Cameroon as part of a major onchocerciasis (river blindness) eradication project. In addition to his academic work, Dr. Switz has substantial industrial experience including design and manufacture of anesthetic gas monitoring equipment and helping found a successful startup making tools for biological research; his work has resulted in many issued patents. Current research interests include development and applications of fluorescence, computational and interference microscopy. Dr. Wharton is developing models that might serve as a realistic basis for quantum theory, in analogy to how statistical mechanics serves as a realistic basis for thermodynamics. In this so-called "psi-epistemic" viewpoint, the standard quantum states are merely states of incomplete knowledge, not states of reality. Although several no-go theorems are commonly thought to indicate that no such realistic formalism exists, such theorems are naturally bypassed in a Lagrangian-based framework, where systems are constrained by both future and past boundaries. To this end, Dr. Wharton's is developing simple Lagrangian toy models, similar to classical field theory, that promise to provide a realistic spacetime representation of what might be happening between quantum measurements. He also writes popular-level accounts of these ideas.